Supreme Court accedes to residents' requests, moves anti-Mandelblit protests to nearby park. Supreme Court judges on Thursday night decided that the protests held outside Attorney General Avichai Mandelblit's Petah Tikva home every Saturday night will be moved to a nearby park, Israel Hayom reported. The Supreme Court also canceled the residents' claim against Israel Police, which called on the police to move the anti-Mandelblit protests somewhere else. "We have solved the issue in question, and the plea is no longer necessary," the court said. "We are therefore canceling it, without forcing either side to argue [before the court]." 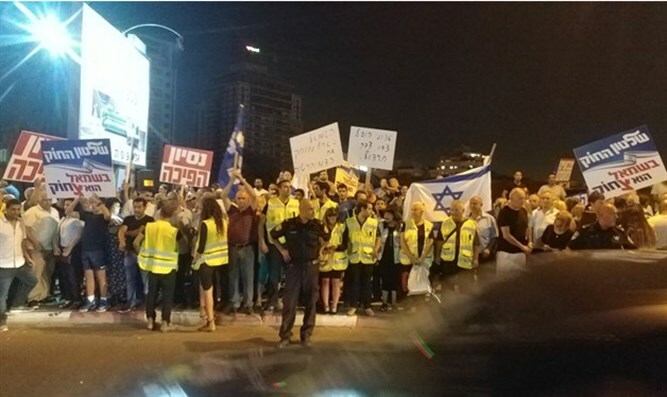 A short time after the Supreme Court's decision, Israel Police announced that the protests would be held at Petah Tikva's Ganim Mall. In response, the Movement for Government Quality sent an angry letter to Israel Police, complaining that no discussions were held before the decision was reached. "The Movement's stance on the matter is...that there was and is no requirement to have a permit in order to protest near the Ganim Mall, and the police's decision to ban protests is disproportionate." The protests began in November 2016, and have been held every Saturday night since. In their decision, the Supreme Court noted that weekly protests for long periods harm local residents' quality of life, and the number of protesters has grown from a few hundred to a few thousand. Since counter-protests are also held, there is a need to rethink where the event is staged, the judge explained. "These protests cannot continue to be held in their current location; they must be held in a more appropriate place, such as Petah Tikva's central park," he wrote. The demonstrations outside Mandelblit's home are by anti-Netanyahu groups in protest of how the A-G is handling the investigations against Israeli Prime Minister Binyamin Netanyahu, urging him to prosecute. One sign went so far as to say: "Guilty until proven innocent," sparking outrage from the right.